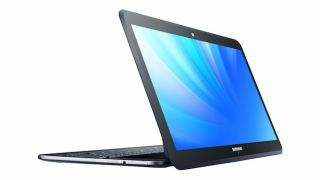 The Samsung Ativ Q is one of the most interesting products we've seen for a while, offering up both Windows 8 and Android Jelly Bean on the same device. You can't detach the super high-res 13.3-inch, 3200 x 1800 touchscreen (apparently the highest resolution on the market), so the Ativ Q isn't exactly a direct rival to the Asus Transformer Pad series. What you can do though, like the Lenovo IdeaPad Yoga and Dell XPS 12, is spin the display round to lay flat on the keyboard in what Samsung is calling "tablet mode". Samsung has managed to keep the Ativ Q relatively slim, measuring 13.9mm in thickness, although the 1290g (45oz) weight may make this hybrid a little unwieldy in hand. There are three other "modes" including the traditional laptop position as well as "float" and "stand" for more versatile viewing angles. Under the hood you'll find Intel's new Haswell chip which in the Ativ Q's case comes in the form of a Core i5 processor. This is backed up with 4GB of RAM which provides the power for the fast switching between Windows and Jelly Bean 4.2.2. You get 128GB of internal SSD memory, a camera capable of shooting 720p video, a battery Samsung claims will last nine hours, plus the Ativ Q also sports USB 3.0, USB 2.0, microSD and HDMI ports for a wealth of connectivity options. There's currently no word on the Samsung Ativ Q release date or price, but the Korean firm has confirmed it will be available in the UK later this year - and we're chasing for details on other regions.